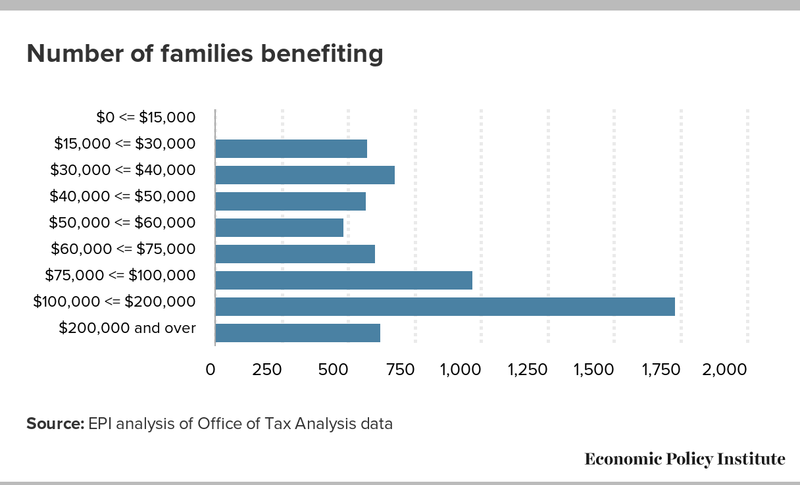 Does Trump’s tax plan help families pay for child and dependent care expenses? Included in President Trump’s announcement of his tax plan earlier this week is a promise to provide “tax relief for families with child and dependent care expenses”. Without more details about his plan, however, it’s near-impossible to judge, but we make an attempt nonetheless. Various news outlets and advocates have speculated that Trump’s initial interest in reforming Dependent Care Flexible Spending Accounts (DCFSA) has since shifted to address a more widely utilized tax credit, referred to as the Child and Dependent Care Tax Credit (see here, here, and here). There are three central questions to ask when facing reforms billed as improving access to effective, high-quality child care and education: (1) Does the policy allow all parents the option to stay home with their infants, newly adopted children, or new foster children? (2) Does the policy relieve the cost burden of early child care and education for low- and middle-income families? (3) Does the policy improve quality by investing in the early care and education workforce? Given the wording of the president’s plan outline, it would appear his efforts will focus on (2) affordability—by either reforming or expanding the Child and Dependent Care Tax Credit (CDCTC)—while remaining silent on (1) parental leave policies and (3) improving child care quality. Right off the bat, his hint at child care reform misses key components, and we will show you below that improving affordability through current tax programs misses the target. Relying on the tax system to improve access to affordable, high quality child care has a number of limitations. As a whole, using the tax system to expand access to affordable child care is especially misguided for three key reasons. First, many families do not have the cash on hand each month to pay out-of-pocket and wait for the end of the year’s tax return. Second, not all current tax credits benefiting household with children are refundable, meaning they are useless if a family owes no taxes. Finally, existing tax programs for child care are not well targeted. In a zero sum world of child care subsidies, many families who arguably don’t need assistance are getting a large share of it. Let’s take a closer look at the CDCTC, the program on which President Trump is rumored to be relying to expand access to child care. As with tax credits in general, analysts have repeatedly criticized several aspects of the CDCTC, including its irrelevance for families who can’t afford to pay out-of-pocket for child care and then wait for a tax refund in the following year, i.e. they are liquidity constrained. The CDCTC is also not refundable, meaning that if a family doesn’t owe federal income taxes at the end of the year, they are unable to be helped by the credit (these are the famous “47 percent” referenced by Mitt Romney; but they are now about 45 percent of households and they absolutely do pay payroll taxes, sales taxes, and all sorts of other taxes). In addition, the credit has been criticized as being poorly targeted because the credit does not phase out at higher income levels. Take for example two families: both have two children and spend $30,000 on child care, but their household incomes are quite different. One household has an annual income of $70,000, and one household has an annual income of $1,000,000. The CDCTC allows each of these families a maximum nonrefundable credit of 20 percent of $6,000 (or $1,200), despite the likelihood that the millionaire’s family is more able to afford child care. Families’ access to the CDCTC varies significantly across the income distribution. 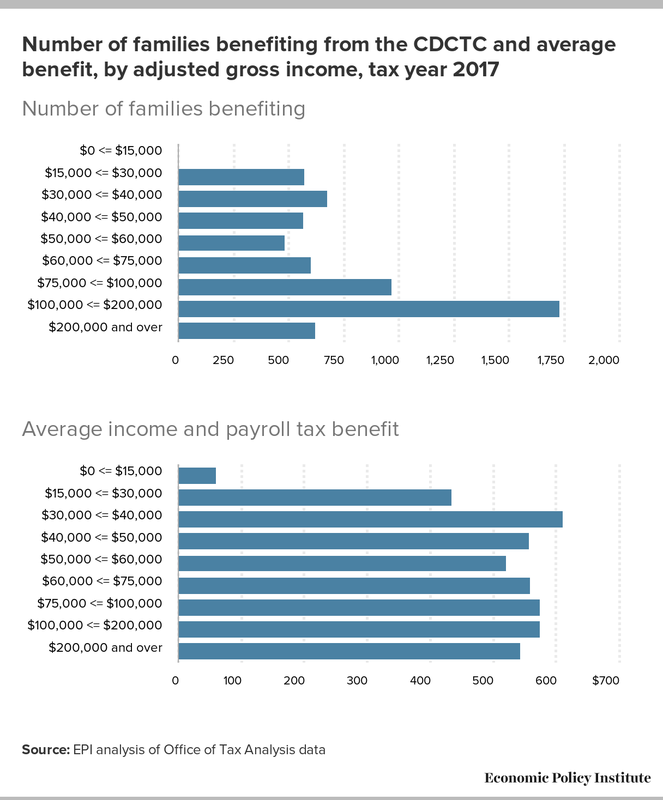 As the left panel in the figure below shows, among families who benefit from the credit, less than 30 percent have an annual adjusted gross income of less than $50,000, whereas almost 40 percent have an annual adjusted gross income of more than $100,000. The median family benefiting from the CDCTC is in the $75,000–$100,000 adjusted gross income bracket. The problem of accessibility is especially acute at the bottom of the income distribution, where an almost immeasurable number of families benefit from the credit— likely because of its non-refundability and lower-income families’ liquidity constraints. Not only does much of the benefit largely miss many of those who more desperately need it to afford child care, the dollars are not progressively distributed among those who get it. 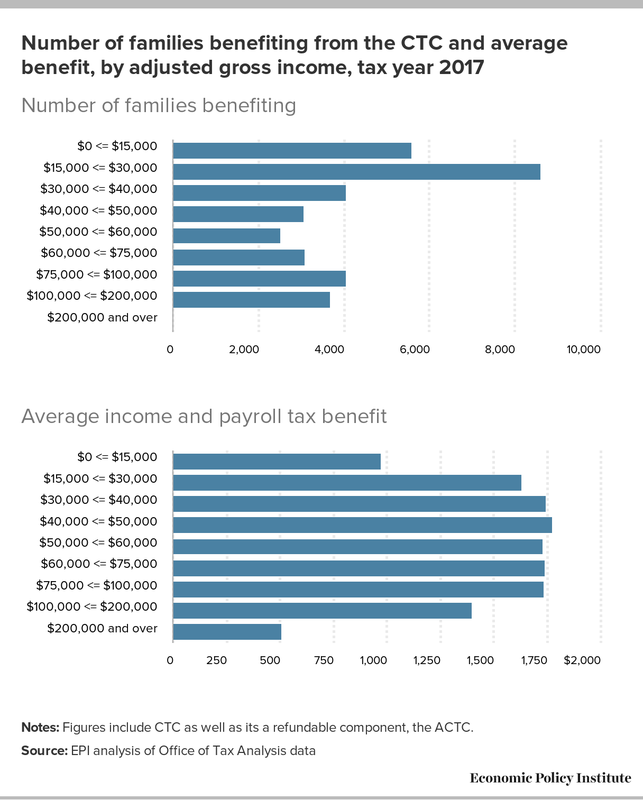 The right panel in the above chart shows that the average benefits are roughly equivalent across for households making more than $30,000 per year and lower for those making less. Given the disproportionately larger burden that paying for quality child care puts on lower- and middle-income households, this is not the sign of a well-targeted policy. 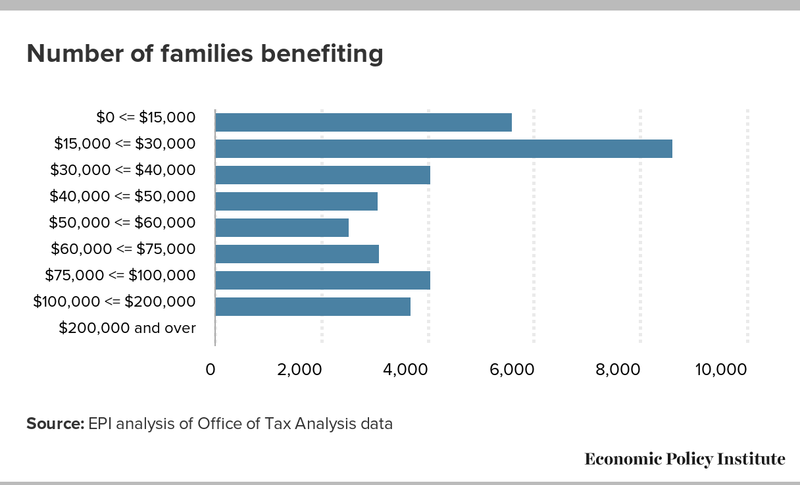 It’s also worth noting how insufficient this tax benefit is to meet child care needs. Annual infant care costs range from $4,822 in Mississippi to $22,631 in Washington, D.C., meaning that even in the least expensive areas of the country the maximum CDCTC fails to cover even three months of the annual cost of child care for an infant (EPI’s child care fact sheets). When families not benefiting at all from the CDCTC are taken into account, these average benefit levels look even more insufficient and poorly targeted. In the below chart, we estimate the average benefit not just for those receiving the CDCTC, but for those families who could be eligible for it. To estimate this number of potentially eligible families, we use the number of families benefiting from the Child Tax Credit (CTC), as well as its refundable component called the Additional Child Tax Credit (ACTC). The CDCTC is available only for working parents, while the CTC is available to all families with children. 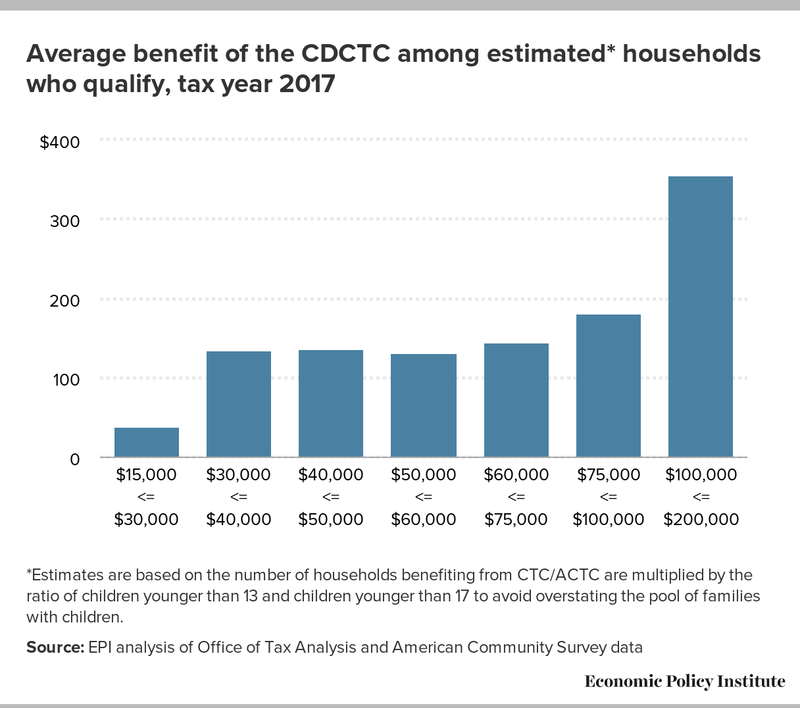 But even though these populations are not directly comparable, the number of families claiming CTC is useful for pointing out the deficiency of families at the lower end of the spectrum benefiting from the CDCTC. For one, a significant proportion of these parents who claim the CTC but not the CDCTC likely work and would benefit from a tax credit for child and dependent care, but do not currently claim the CDCTC because it is not refundable. Others might not work currently but might choose to work if resources—such as a refundable credit—were available to help them pay for child care. *Estimates are based on the number of households benefiting from CTC/ACTC are multiplied by the ratio of children younger than 13 and children younger than 17 to avoid overstating the pool of families with children. 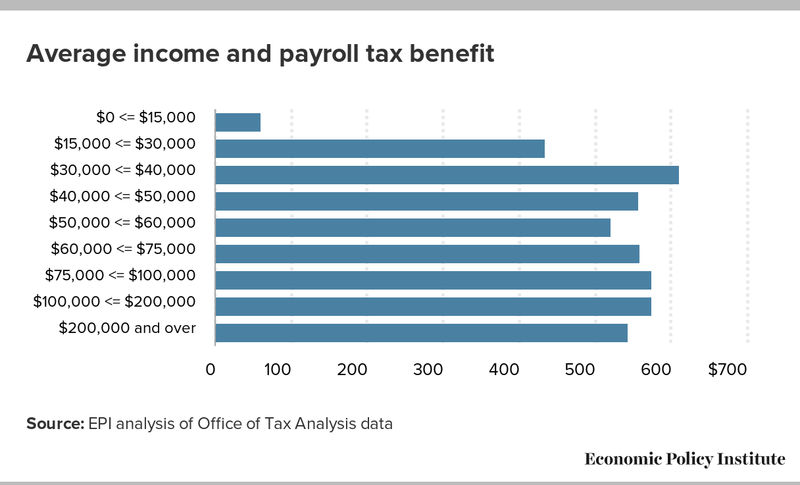 The resulting average benefit looks much less progressive, because estimates of average benefits that do not take into account families’ inability to benefit from the tax credit will overestimate its progressivity. Refundability: The CTC is partially refundable, meaning that families without a tax liability may be able to receive a refund. According to the Office of Tax Analysis, 55.7 percent of the total number of families eligible for the CTC receive at least part of their credit as a refund. By contrast the CDCTC is nonrefundable, meaning for a substantial portion of parents who do not owe taxes the credit is inapplicable. Income restrictions: The CTC begins phasing out at adjusted gross income of $75,000 for a single head of household or $110,000 for married filers (credit is reduced thereafter by $50 for every additional $1,000 of income above the threshold), whereas the CDCTC is applied identically for all households with incomes above $43,000. Age limitations: The CTC is can be used for dependent children under age 17, whereas the CDCTC can be used for children under 13, elder care, or other dependents needing care. 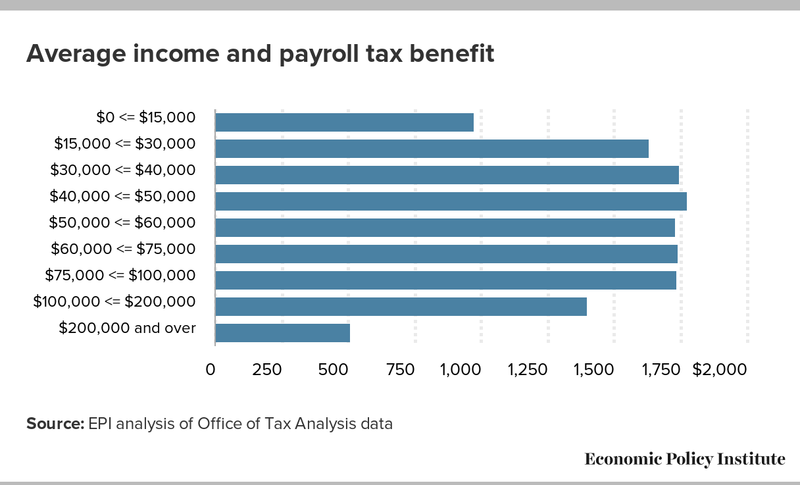 As a result, the median person benefiting from the CDCTC is in the $75,000–$100,000 adjusted gross income bracket, whereas the median person benefiting from the CTC (and ACTC) have adjusted gross incomes in the $30,000–$40,000 bracket. Notes: Figures include CTC as well as its a refundable component, the ACTC. As the above charts show, the CTC more effectively targets lower-income families. Its partial refundability makes it possible for lower-income families to receive benefits more comparable to higher income families, and it provides more money to families. Given the burden of affording child care, increasing the average benefit provided by the CDCTC and making the distribution of its benefits comparable with the CTC would put a more meaningful dent in the price tag that families face from child and dependent care. Nevertheless, the CTC is far from perfect. The CTC is still a fairly modest benefit, and families are only able to receive the credit once per year. Families might appreciate a reformed tax credit for child and dependent care, which is more generous, advanced throughout the year, and fully refundable. Given the limitations of tax policy to expand access to child and dependent care, President Trump’s prioritization of the CDCTC is still not a promising start for a productive national discussion of child care policy. In the past, analysts including the National Women’s Law Center, Tax Policy Center, and the Economic Policy Institute have supported making the CDCTC refundable, which could dramatically improve lower-income families’ access to child care. However, other changes which increase the maximum credit for higher-income families could easily make the credit less progressive and fail to make any material difference for working families most in need of access to affordable, high-quality child care. As discussed in detail by Bivens et al. (2016), direct investment in high-quality child care—for example, through subsidization of high-quality programs— could go much further than tax credits in improving families’ living standards and closing the achievement gap at a time when we are under-investing in childhood development and programs. The current patchwork of American policy aimed at aiding families to find high-quality, affordable child care is deeply flawed. But while the Trump administration is right to propose changes, relying on changes to the CDCTC as a mechanism to achieve such change is highly inefficient.